David Lichtgarn was born in 1873 in Rohatyn, Galicia, the son of Jacob Lichtgarn and his wife Beile Glanzberg. He studied medicine at the University of Vienna, relocated to practice in Borysław, and married Rose (Rozalia) Liebermann in 1902. 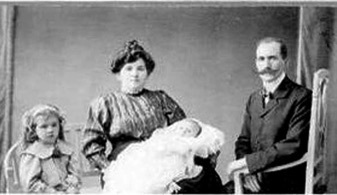 Rose was born in 1877 to Israel Liebermann and Chana Waldinger of Borysław. 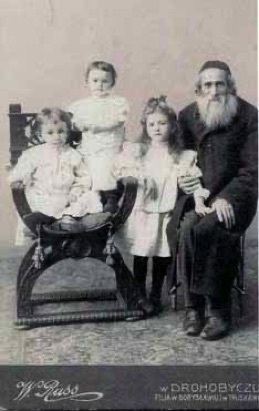 David and Rose Lichtgarn with their children, Anna Blanka, born around 1904 and Dolek born around 1908. The photograph was taken in 1908. 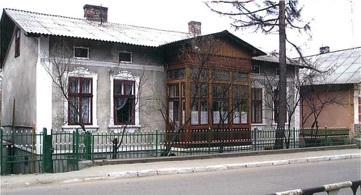 David practiced medicine in Borysław and in the 1930's lived in this house. He and his wife Rose died in the 1930's prior to the Holocaust. 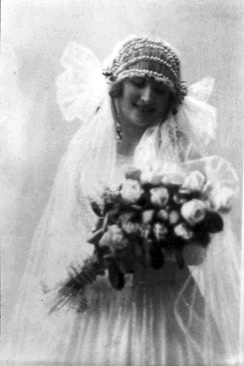 Right: Here is Blanka in the mid 1920's when she married David Landau of Przemyśl. Nancy Siegel, whose grandfather Leib (Leo) was the brother of Blanka's father David Lichtgarn, finds this photo particularly sad and touching because Anna Blanka, looking so beautiful and happy has no idea of the horrors that were coming. Left: Anna Blanka in a photograph taken in the early 1920's. Right: David's daughter Blanka Lichtgarn and her brother Dolek taken around 1925. Dolek was in medical school in Italy when the war broke out. He was able to emigrate to the United States. Like his father, he became a physician. These photographs were contributed by Nancy Siegel, Jacob Lichtgarn's great granddaughter.